Finally, I would like to draw Japanese map with some famous Onsen. Noboribetsu, Beppu, Kusatsu, Arima and Dogo would be the best five Onsen by their history and name recognitions. 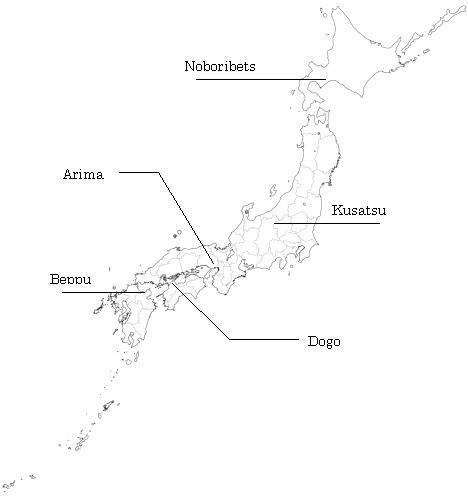 The locations of the Onsen are drawn on the below Japanese map. If you'll visit any places close to the Onsens, please try the Onsen. At that time, you wouldn't only enjoy the Japanese cultures but also your strains of your long journey would be relieved your fatigue.